The country of Denmark generated enough wind energy on Wednesday to power the entire country’s electricity needs, according to new figures from Europe’s wind energy trade body, WindEurope. According to WindEurope, Denmark generated a total of 70 gigawatt-hours (GWh) from onshore wind and another 27 GWh from offshore wind — enough to power the equivalent of 10 million average EU households. 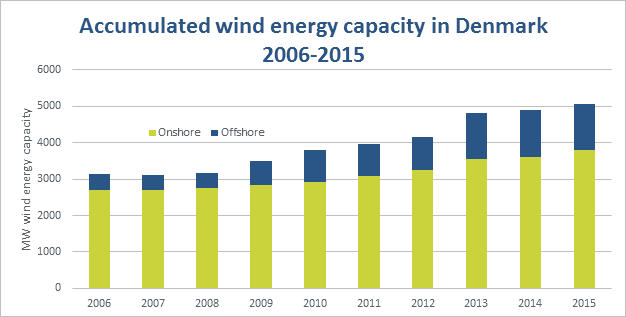 This is not the first time wind power has dominated generation statistics in Denmark, with several big wind energy days back throughout 2015. By the end of 2015, the country had a total of just over 5 gigawatts (GW) worth of wind energy installed — made up of 3799 megawatts (MW) of onshore wind and 1271 MW of offshore wind — a number which likely would have increased during 2016. However, 2016 was something of a slower year for the country’s wind energy industry, with low wind speeds throughout the year, meaning Danish wind turbines only generated approximately 37.6% of Denmark’s total electricity consumption. While 2016 might have been a slower year, 2017 started off with a bang thanks to MHI Vestas Offshore testing its new 9 MW wind turbine which, in testing at the company’s Østerild wind turbine test field off the coast of Denmark, broke the energy generation record for a 24 hour period.